Julia Child (August 15, 1912 - August 13, 2004) was an American chef, author, and television personality. 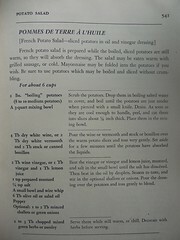 She introduced French cuisine and cooking techniques to the American mainstream through her cookbooks, beginning in 1961 with Mastering the Art of French Cooking, and her television programs, notably The French Chef which premiered in 1963. 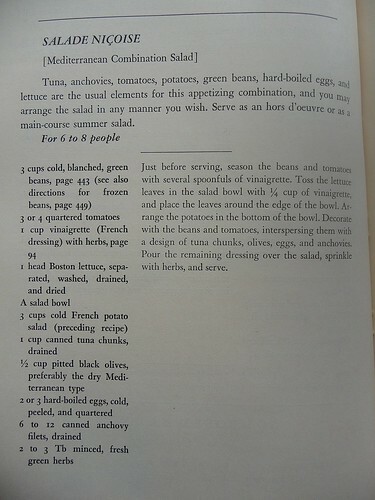 Tonight's dinner is from the Book of Julia (10th printing, August 1965) - a California Native. I will be trying to stick to the recipe as best as possible AND use only California Products. It was quite easy procuring the produce. There are Farmers Markets every day somewhere around here and The Bowl always tells the veggie's origin. 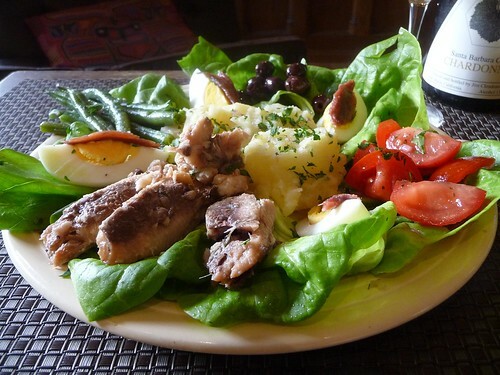 Petaluma eggs, Central Valley olives and olive oil, Au Bon Climat chard, almost every ingredient needed to make the primary and secondary recipes was grown or produced in Sunny C.
And as for the tins, You know that I know that You know Who's fishing and tinning these local waters. 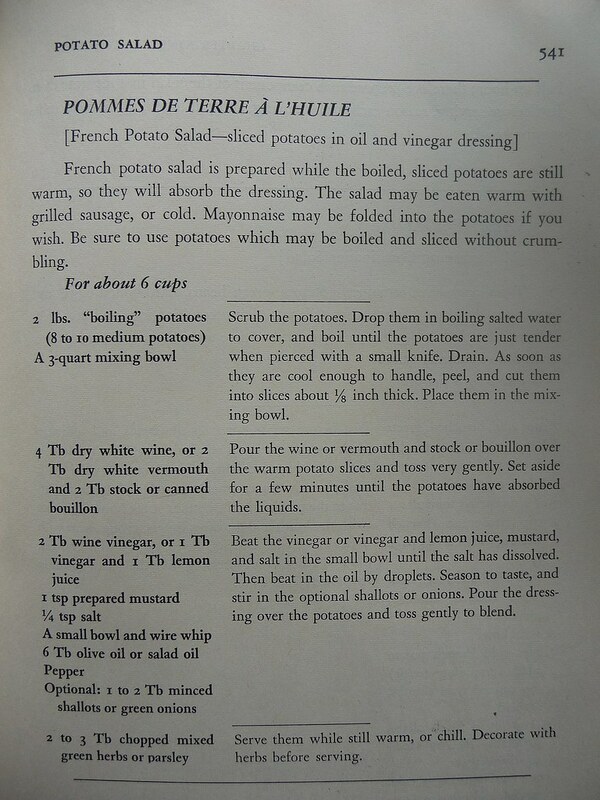 I'm following the vinaigrette recipe, the blanch the beans recipe, and even the French potato salad recipe. Cannery Row Sardines are harvested from the frigid waters of the Pacific Ocean, and canned locally. They are being sold on Cannery Row and at local Farmers’ Markets, as well as globally via their Web site. The first CRSC cans contain boneless, skinless filets, packed in pure olive oil. 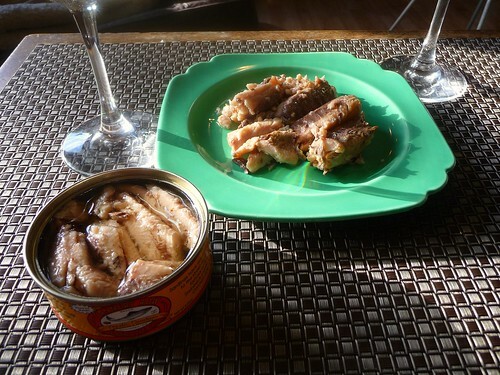 Other varieties, including sardines in tomato sauce, will be introduced soon. With the Omega-3 craze in full swing and the sustainable way that Pacific Sardines are harvested, this entrepreneurial venture appeals to history buffs, nutritionists, and environmentalists alike. 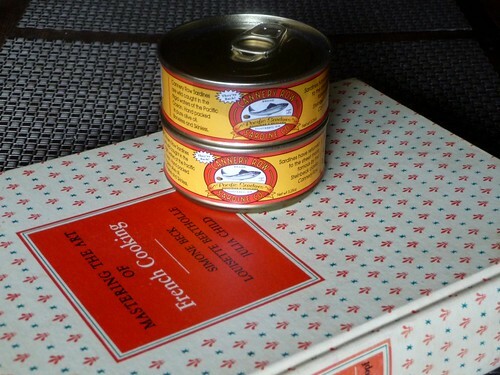 I scored these tins on a Field trip ($7.95), but I did recently see this at the corner of 4th and Harrison, SF. And You wonder why all the tinneries are gone. 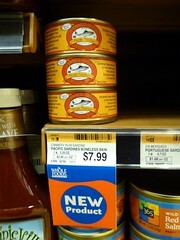 It is cheaper to ship the fish to Asia, have them tinned and shipped back. If You want U.S. Tins it starts here. Support Your Local Tinnery. If they can turn a profit others will see this and bring competition. I know they're spendy but once in awhile, now and again, with a nice bottle of Central Coast chardonnay. Too soon, too soon, let's look in the tin. It's a round tin, which I'm pretty sure was dictated by the tinnery. I know from experience the traditional tins are not readily available in the U.S. It would have raised the price again and 3.25 oz is barely lighter than most traditionals. Custom packed by Dave's. At least You can grip it and rip it. I know I should love these hand packed beauties. They are super clean with a mild marine flavor. I like the bits mixed with the whole fish. They are very firm and I feel a little too lean. They Are Tuna Texture. Any Tuna Recipe, Anywhere, Anytime. 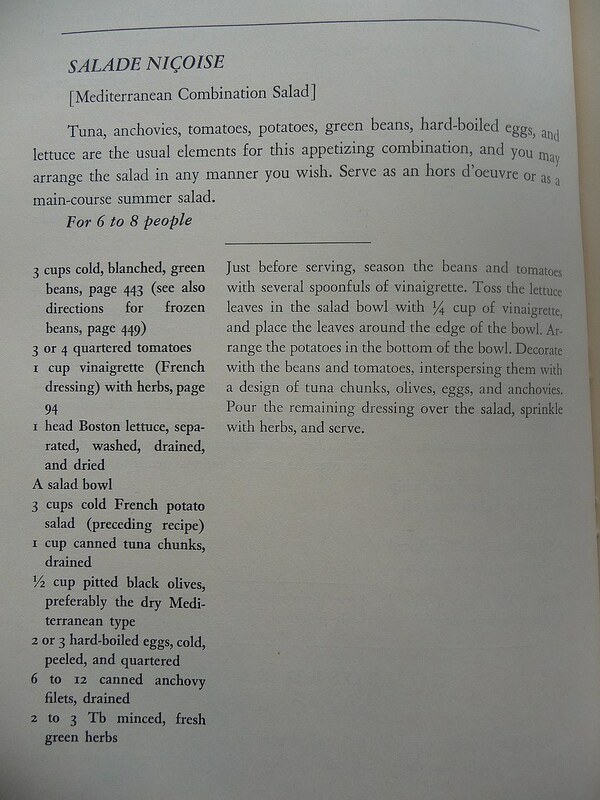 Including tuna salad, tuna melt, or tunafish sandwich; this tin can be substituted with love and tenderness. There's Love in There! It's a good tin. Four out of Five Tins. I am in pregnant life heaven with this post!!! Looks amazing! !